The Holiday season is upon us, and that alone brings about stories about Jesus that just feel natural to the season. 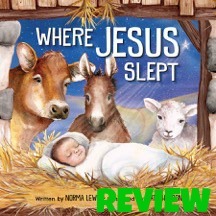 One of the first things I noticed about “Where Jesus Slept’ written by Norma Lewis ,were the beautiful illustrations by Katy Hudson Soft and colorful, they seemed to be more small pieces of art instead of illustrations in a book. My 4 year old LOVED this book, and while admittedly it left me a bit out of breath when reading due to the “there was an old lady that swallowed the fly” (repetitive and an educational) type of story telling, I loved it too! What a fun way to tell the story of the birth of Jesus in interesting and enaging way.